After World War I a League of Nations was formed on January 1920 as a result of the Paris Conference to avoid future wars! Nonetheless World War II erupted. The League of Nations was replaced by the United Nations and was founded in April 1946. The foundation of the UN was to be based upon political concepts and world peace. The real reason, however, is based upon religious concepts for a one-religion in a one-world government. True peace only God can bring. Where Christ is, the Light of Life, there is also the anti-christ, the light bearer, named Lucifer. The light bearer wants to rebuild the tower of Babel. Genesis 11:4 And they said, Go to let us build us a city and a tower, whose top may reach unto heaven; and let us make us a name, lest we be scattered abroad upon the face of the whole earth. Genesis 11:8 So the LORD scattered them abroad from thence upon the face of all the earth. The symbol of the United Nations is based upon a compass pointing in the four main directions: north, south, east and west. It has 8 x 4 is thirty two sections and one center point makes thirty three. A wreath of laurels is encircling the earth as a crown*; the laurels are connected together. Laurels are mostly representing a crown. A crown is worn by a king; a king always has a kingdom. On the symbol the flat earth is the kingdom and it is wearing a crown. The wreath is put upon the head of someone who initiated into a mystery religion and knows how to use the power of four. ** According to the UN the logo and the laurels are a symbol of peace. But is it? No it is not. It represents the fourth beast who is coming to rule over the world as a dictator. It is the fourth beast a celestial creature that is going to conquer the world. Revelation chapters 13 and 17. The evil characterisation of the United Nations signifies one (1) king surrounded by 32 kings. The UN will bring peace into this world even if they have to murder humanity. Unicef UN declaration we are going to take away all the children because their parents are not able to care for them the right way. The UN plans to take the children, the women, the gold, the money thinking it should belong to them. 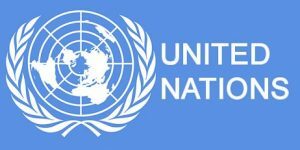 This is the evil spirit behind the United Nations. They plan to own everything; their concept is all about paving the way for and crowning the anti-christ. 1 And Benhadad the king of Syria (1) gathered all his host together: and there were thirty and two (32) kings with him, and horses, and chariots: and he went up and besieged Samaria, and warred against it. Make a choice. Make the right choice. Make the choice for Christ, the Light of Life. The time is now. There will be no second chance to make the right choice. * Source: “The Secret Teachings of All Ages Manly Palmer Hall ”Wreaths were worn during the initiation unto the mysteries and readings of the sacred books to signify that these possesses were consecrated to the deities. On the symbolism of wreath Richard Payne Knight writes instead of beads, a wreath foliage generally laurel, myrtle, ivy or oak appears on coins, sometimes encircling the symbolical figure and sometimes as chaplets upon their heads. All these were sacred to some peculiar attributes, and in general all evergreens were dionysiac planes that symbols of generative power, signifying perpetuity of youth and vigor, as the circles of beads and diadems signify perpetuity of existence” End of quote.